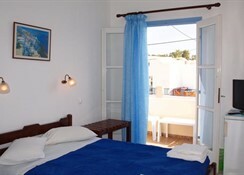 Narkissos Hotel can be found in the popular resort of Kamari in Santorini, close to the beach. All the resort amenities, restaurants, bars and the lively nightlife is a short walk from the Narkissos Hotel. Kamari is located on the east coast of the island with a stunning long sandy beach and plenty to keep the whole family occupied on a holiday to Santorini.This 2-star Santorini hotel is 3 miles from the airport, so you wonâ€™t have to endure long transfers to your holiday destination in Kamari. 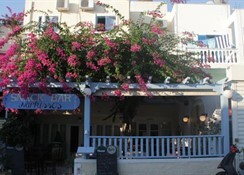 Narkissos Hotel has a total of 18 guest rooms, all with telephone, fridge, satellite TV, hair dryer and a balcony/terrace. Onsite you will find a breakfast room, a snack bar serving snacks and refreshments throughout the day and Internet access should you want to keep in touch with the outside world on your holiday at the Narkissos Hotel in Santorini.Santorini can be found in the Greek Cyclades and offers picture perfect resorts, charming villages, blue-domed churches and long dark volcanic sandy beaches, the ideal retreat from the hustle and bustle of home life â€“ so book your perfect Santorini holidays today! 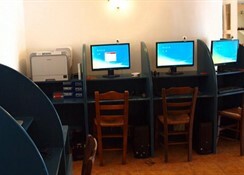 GeneralThe hotel has an internet cafe and snack bar downstairs. 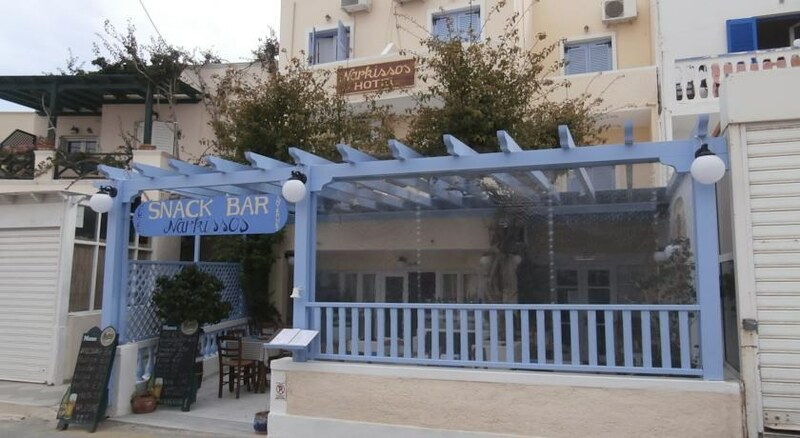 Our customers have free access to the nearest bar, swimming pool, where you can use the pool and a 10% discount cards to the greatest beer on Santorini restaurant Just4 where you can enjoy delicious meals, beers and live music. Check-in at our hotel at 13:00, check-out until 11:00, we serve breakfast from 8:00 to 10:00 Reception is open from 7:00 am to 1:00 pmLocationNarkissos hotel is located on the island of Santorini, in the beautiful village of Kamari, with a long black beach. Easy access to the beach, night clubs, discos and pubs. 50 m from the nearest bus stop for local destinations of the island, 10 km from the capital of the 'island - Fira, just 4 km from the airport, this hotel makes it easy to reach.RoomsThe hotel has a total of 18 cozy and clean rooms - single, double and triple. A cot is available upon request. 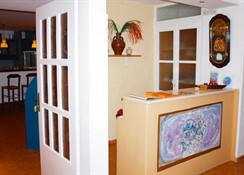 All our rooms have bathroom, refrigerator, satellite TV, air conditioning and safe.ExteriorNarkissos hotel is a small and friendly hotel of economic class, which is built in traditional style of Santorini, one of the best in its class. Every day our hotel gives you a lot of positive impressions and makes your exciting vacation. Our complex with a traditional village atmosphere relaxes visitors. 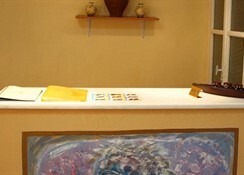 The management and staff assure you a pleasant and charming. A holiday at the Narkissos Hotel is the right choice for couples and families looking for cheap holidays to Santorini, simple and comfortable accommodation close to the beach and all the action in the resort. 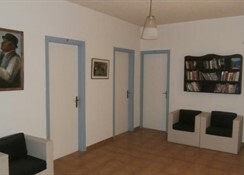 All have WC â€“ bath/shower â€“ fridge â€“ satellite TV â€“ radio â€“ hairdryer â€“ telephone â€“ balcony/terrace. The hotel has a restaurant serving a range of dishes and a bar serving drinks throughout the day and night. Narkissos Hotel is only 200 metres from the black sandy beach in the resort where you will be greeted by a stunning 2 km stretch of sands. Why not try some of the water sports on offer on your Kamari holidays including windsurfing, jet skiing, kayaks and peddle boats for the less adventurous. You could book a boat trip, hire a car and explore the island or hop on a glass-bottomed boat trip on your family holiday to Santorini. All the amenities, shops, restaurants, bars and the lively nightlife are a short walk from the Narkissos Hotel in Kamari â€“ so book now!